Now you can support us by doing something you probably do on a regular basis: SHOPPING! Amazon will donate 0.5% of the price of your eligible AmazonSmile purchases to Light of Truth Center, Inc. whenever you shop on AmazonSmile. Click NOW on the “Support Light of Truth Center” AmazonSmile graphic to start receiving and giving at the same time! Your participation will help the Light of Truth Center to continue its support of women in recovery. From fancy cars and expensive clothes to fine dining and exotic vacations, there are many ways you can spend your hard-earned dollars. And there is nothing wrong with rewarding yourself for a job well done — but what would happen if you rewarded someone else instead? Giving your money or time for a cause can benefit your psychological, spiritual and emotional well-being. When you donate to a charitable organization or a non-profit group, the amount you donate is tax deductible. But not only is the money you give tax deductible, so are the amounts you spend on travel, parking costs and even convention and event fees that are related to the non-profit group, as long as you are not being reimbursed by the charity for these expenses. Of course always check with your tax adviser about what you, in your particular circumstance, can claim as deductions. Click the “Donate” button below to go to our secure donation page to complete your donation information. Remember that selfless giving is a key component to many spiritual and religious belief systems. Recognizing that you have taken action in line with your spiritual beliefs by offering your time, talent and treasures to others in need can bring a sense of inner peace and contentment. You also can support us by volunteering or donating items such as linen, clothes, furniture, kitchen items, computers, etc. The Light of Truth Center, Inc. is a charitable and educational organization designated as tax-exempt under Internal Revenue Code section 501(c)(3). 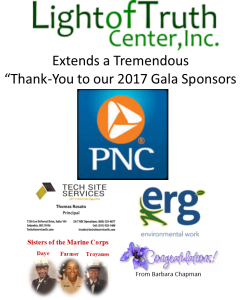 A copy of our financial statement is available upon request by contacting The Light of Truth Center, 3308 Kyle Court, Baltimore, MD 21244. Documents and information submitted under the State of Maryland Charitable Solicitations Act are available from the Office of the Secretary of State of Maryland, Annapolis, MD 21401 for the cost of copying and postage.The Light of Truth Center, Inc. is a 501 (c)(3) Non-Profit Organization. Donations are tax deductible according to the laws within your state.